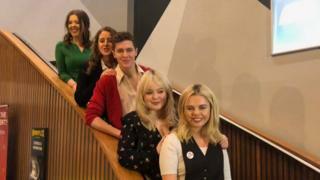 A man has been jailed for four months for stealing catering equipment from a Derry Girls premiere event in Londonderry's Guildhall. Adam Raymond McDaid admitted stealing £1,560 worth of equipment from the function. The function was held on Monday night, after the premiere of the second series of the Channel 4 show. McDaid also pleaded guilty to stealing a blue BMW jacket, a toolbox and to assaulting a police officer. The 24-year-old, from Bonds Hill in the Waterside area of the city, headbutted the officer in the face after his arrest. Londonderry Magistrates' Court was told that McDaid, who has 141 previous criminal convictions, 36 of which are for theft, had only been released from prison on licence three weeks ago. A solicitor for the Public Prosecution Service told the judge that McDaid stole the items from a catering trolley during the Guildhall event. He was challenged by Guildhall staff members who, along with other people at the function, chased him across Guildhall Square before he entered a bingo hall in Bank Place. He then locked himself in a disabled toilet and was held there by staff and members of the public until the police arrived. After his arrest, McDaid was taken to a police station, where he became increasingly aggressive and headbutted a PSNI officer. He told police he was drunk and that he did not remember anything about the incidents. However, when he was shown CCTV footage from both inside and outside the Guildhall, he identified himself on the footage to the police and admitted the theft and assault offences. A defence solicitor said the catering company was "catering for the great and the good, among them city councillors, following the screening of parts of the second series of the Derry Girls". "I am tempted to wonder if this incident might feature in an episode in series three - maybe Danny De Vito could play my part," he said. Mr Quigley said McDaid was "wandering outside the Guildhall drunk and under the influence of drugs and he seized the opportunity from his point of view". "He was certainly not aware of the fact that the cutlery items were valued at over £1,500. "He also cunningly stole the blue BMW jacket and put it on before stealing the knives, in that he was aware that people wearing such jackets were bringing equipment into and out of the Guildhall. "Apart from the serious assault on the police officer, there was an element of comedy about the whole thing." The district judge said he has been dealing with McDaid since the defendant was a 12-year-old boy. "One thing that is quite clear is that when he is out of custody he will re-offend," he said. "If there was any prospect of turning him around, I would consider it, but there is nothing in his behaviour to convince me he has arrived at that point. "He was released just three weeks ago and he again re-offends. "It is fortunate for the catering company that all of the stolen items belonging to them were recovered and fit for use."